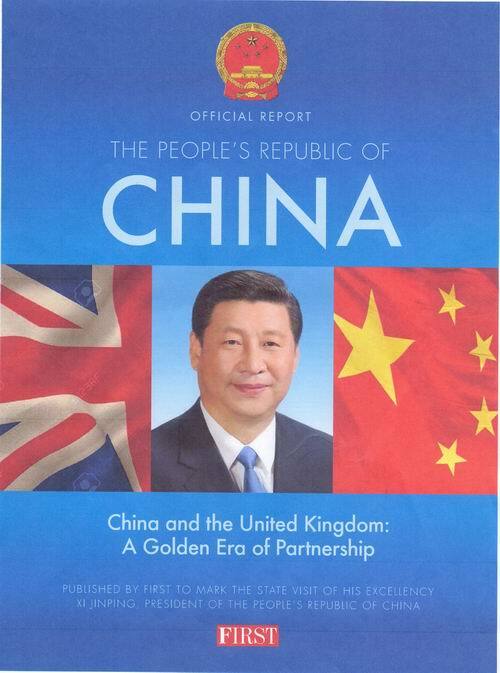 The British 'FIRST' magazine published a report entitled "China and the UK: A Golden Era of Partnership" to mark the state visit of President Xi Jinping to UK. President Xi noted that the Chinese and British people share long histories and outstanding cultures, and are common in terms of welcoming new developments and changes that come with the times. Despite the distance between the two nations, people from both countries feel close to one another because of their pull towards each other's art and literary creations as well as science and technology. "Seventy years ago, our two countries joined in the building of the post-war international order based on the UN Charter, and we have since worked together to maintain that order," the president said. "It is my hope that the Chinese and British peoples will carry on our joint efforts in defense of the fruits of the victory in the World Anti-Fascist War, that we will uphold the purposes and principles of the UN Charter, and that we will promote the building of a new type of international relations based on win-win cooperation." The president also wrote about the strategic partnership between the two nations, which has seen both achieve remarkable standards in several areas of cooperation, including education, culture, science and technology, trade and economy, energy and climate change. Apart from indicating the past strengths of the countries' relationships, Xi also focused on the future of their bond, which he believes will be a driving force for mutually beneficial results. On this, the queen supported the president and said, "I look forward to welcoming His Excellency Xi Jinping and to the opportunity which this visit gives us to strengthen the ties that already exist between our two countries." British Prime Minister David Cameron also praised the president's visit to Britain and said that this would be a new start to the golden era of China-Britain relations, with the countries' initiative to build a global partnership to tackle the severe challenges of the 21st century.